These are flowers to illustrate fairy tales, and so easy that a child can grow them successfully. In fact, once you plant them, they may just grow on their own happily ever after. They are one of my favorite reseeding annuals. The petals of the Shirley poppy are described as tissue paper or tissue silk, and for such a sturdy plant everything about them seems impossibly delicate. From the fairy-winged flowers to the wire thin stems rising from a basal nest of mid-green hairy leaves, they flutter and wave in the wind. Sometimes the petals sparkle with raindrops clinging to their translucent surface. Nothing is prettier than a horde of these poppies gathered in spaces throughout the garden arrayed in their best gowns of sparkling, luscious colors for a dance in June. They are somewhat ephemeral, though. Liking cooler temperatures, they tend to melt during the hottest part of the summer. But that isn’t surprising for something that seems so delicate in appearance. 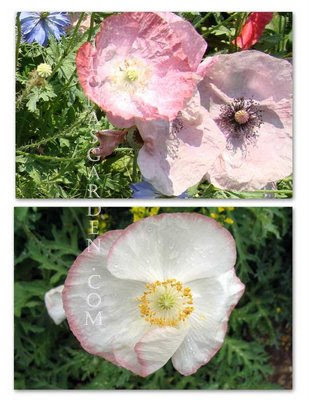 Shirley poppies have a wide variety of colors in their hybridized selections. My favorites are the pastels, with lavenders, pale rose, white, and pinks, often picotéed around the edge of the petals with rose red or in soft bicolors. The Shirley poppy color selections can range in color from cool whites, pinks, rose, and lavenders to cheerful yellow, orange, and scarlet, and can be doubles. Originally the Shirley poppy, Papaver rhoeas, was found in corn fields of Europe, the one made famous in Flanders and worn on Memorial Day. Shirley poppies are perfect additions to a Cottage Garden. They can be used as cut flowers if you singe the cut stem with a flame to seal it. To plant Shirley poppies, simply sow lightly and thinly on top of the soil. Press into the ground to make good contact. They benefit from freezing, which is why it is recommended that you plant them in the fall, but that is not necessary.Poppies need sunshine, but other than that are happy to tuck themselves in many places in the garden. They don’t like to be transplanted, but I have experimented with moving a few that were “weeded out” – so I’ll let you know how that turns out. Poppies are mildly poisonous, having alkaloids in all parts of the plant. Never had a problem with any of my animals or kids trying any out. It is the Opium poppy, not papaver rhoeas, that is grown for medicine, narcotics, and poppyseeds for food use. That is a different variety than the Shirley poppy. I had originally planted one collection called “Fairy Wings” which I had ordered through Thompson & Morgan, no longer available; “Angel Choir” is probably the closest choice. I notice Swallowtail Seeds has a mix looking similar to “Angel Choir”.